As Hunger Action Month comes to a close, I want to extend a huge thanks to all of you who donated to the Food Bank this month. I greatly appreciate those who shared my posts, checked out the links, wore orange, and helped spread the word. I have one last project to share for Hunger Action Month 2016: Sweet Potato Birds. I bought three sweet potatoes and showed them to Trevor. He declared that one looked like an eagle, one like a quail and one just looked like a sweet potato. So we turned two of the sweet potatoes into birds and used the other for spare parts. Peel a whole sweet potato. Put the peels onto a plate. 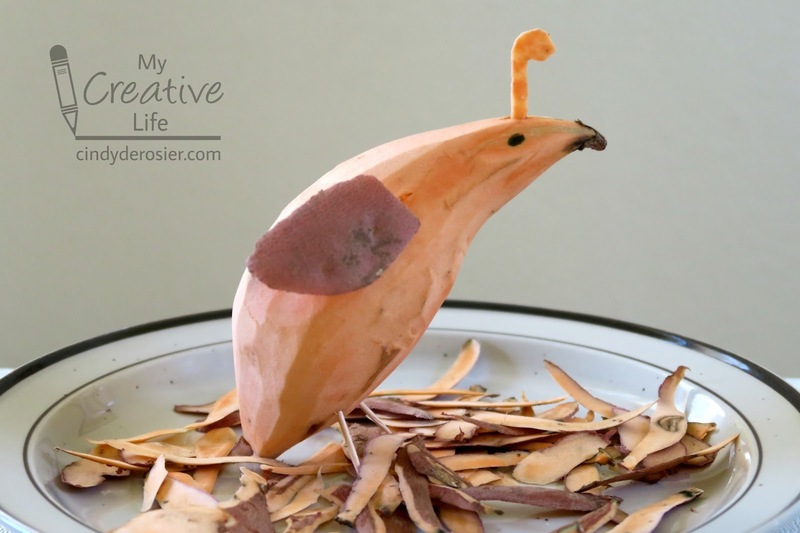 Use the spare sweet potato to carve a topknot and to sliver a pair of wings. 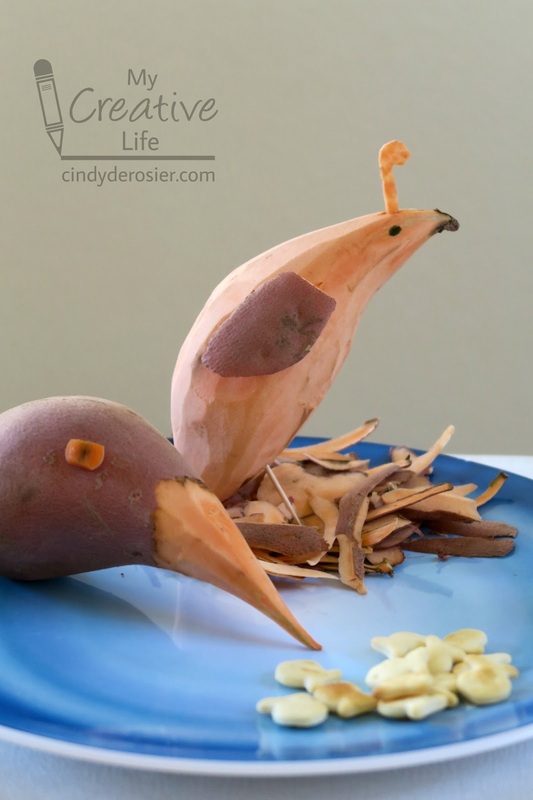 Add two toothpicks for legs; together with the tail end of the sweet potato, it should now stand up in the peels. Attach the wings with toothpicks and carve a slot for the topknot. Use a food marker to add eyes. 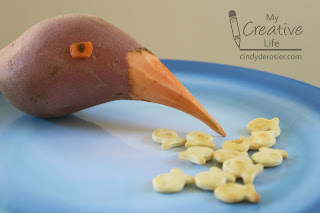 Peel just the pointy end of the sweet potato to make a beak. Carve an eye and add a pupil with a food marker. Put it onto a plate along with an eagle's favorite food: fish. After photographing our sweet potato creations, we took them apart and cut the sweet potatoes into chunks. We put them in a foil pouch with a small pat of butter and a teaspoon of maple syrup. After about 20 minutes in the oven, they were perfectly done and SO good. 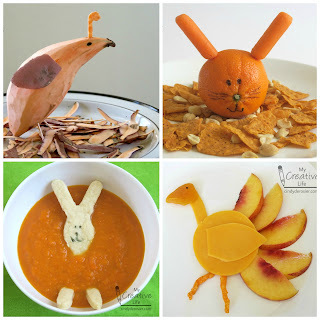 I decided to collage all the orange edible crafts Trevor and I made this month... and I realize now that we made only bunnies and birds! Here I'd thought we'd made a wide variety of stuff, but apparently not! At least the ingredients are mostly different from project to project! While Hunger Action Month is coming to an end, hunger continues. Please continue to support your local Food Bank by donating money or food, volunteering your time, or simply spreading awareness. Each of us can make a difference. I love these "birds!" Great job and thank you for spreading the word about hunger in our community! Loving those birds! What a great idea!!!!!!!!! !